Just found a great way of giving a friend a growing garden gift on Green Fudge. 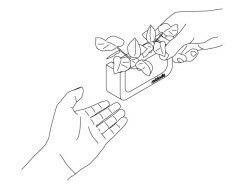 Its a stylish planter that allows you to grow seedlings and then simply pull apart once the seedling has grown to a couple of inches. The product is called Osusuwake (means sharing in Japanese) by designers Kenma. The image is teeny – check out the product’s slideshow on Kenma’s website. ’employs the use of Puffcal—a lightweight, gel-like soil substitute. Simply plant your seeds and once they sprout, you can section off the planter and distribute it amongst friends’. As a big fan of mud pies in my youth I can really relate to the idea of giving dirt as gift. 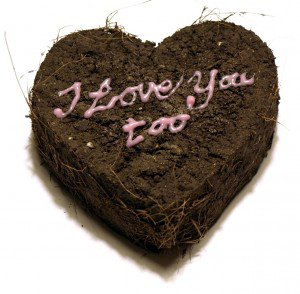 Urban Gardens just posted a review of a heart shaped dirt gift with a strong eco message developed by Luvmud. The gift is handcrafted from soil, worm castings, cow manure, clay, and coconut coir, embedded with seeds for germination. Ha love it. Next articleSoil Investigation and Copper Planter Pots. Garden accessories that may be killing your plants.